FRIENDS have rallied together to raise more than $10,000 for Two Rocks resident Julie Robinson, who is battling a debilitating neurological disorder. Unbeknown to Mrs Robinson, her former colleagues at Specsavers Wanneroo organised a quiz night in her honour at Ocean Reef Sea Sports Club recently. “I went in and this room was packed with people, absolutely packed; I couldn’t believe what I saw,” she said. Specsavers stores across WA also donated $5 from every eye test conducted on one day, collecting more than $5000 and resulting in $10,800 being presented to Mrs Robinson to help pay for medication and tests needed to treat her condition. In January, Mrs Robinson experienced continuing severe pain in her feet and legs and was admitted to hospital. “I had pain everywhere, all over my body, I’d never known anything like it, it was like loads of needles, very sharp,” she said. In mid-March, she was diagnosed with Chronic Inflammatory Demyelinating Polyradiculoneuropathy, a condition where the immune cells incorrectly attack nerves in the body, and remained in hospital until the end of April. The disorder affects her movement, balance, thought processes, immediate memory and speech, and Mrs Robinson requires a wheelchair for outings. She takes five types of medication twice per day, as well as painkillers and every three weeks has to undergo an infusion that is a seven hours per day, three-day process. Despite treatment, she said “nobody knows” her prognosis. “Apparently I could get better tomorrow, which is very unlikely, or on the other hand I could carry on like this for the rest of my life,” she said. “There’s no way of knowing. “I decided if this is going to be me then I have to embrace it,” she said. Mrs Robinson said the money will be kept for paying for treatment and tests, including an upcoming MRI expected to cost about $1000 and potentially a wheelchair. “I never thought I would ever be on the receiving end and I felt humbled and so tearful with joy,” she said. 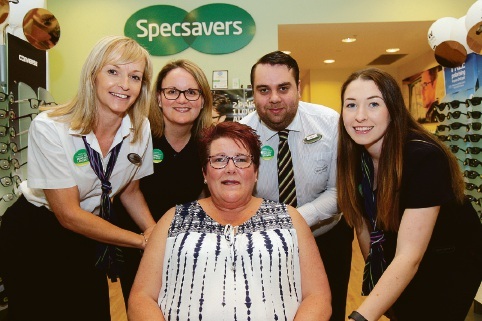 Specsavers Wanneroo owner Kim Turner, who helped organise the fundraiser, said the close-knit team wanted to do something to assist their friend and were stunned by the response. “It was absolutely amazing, we were blown away,” she said. “She’s just beautiful; she’s not got a bad bone in her body.